It's time for another fun Peachy Keen Challenge, and I've got a card to share with you for it that is WAY outside of my comfort zone! That's what challenges are all about, thought, right? Makes us step outside our comfort zone once in a while? This challenge is a photo inspiration challenge, and this is the photo from which we are to draw inspiration from. There's a beautiful color palette that could be followed, and I did choose a couple of colors from that, but only the orange and yellow. When I saw those colors, I immediately thought of the background paper that we made at the Copic Color and Ink Workshop I attended in Anaheim, CA in January. The vibrant yellow and orange background was where inspiration took me. That and the tiny bit of a red frame you see around the window in the back of the photo. Well, here's my card so you can see for yourself. 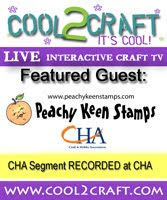 Drop by The Peachy Keen Stamps Challenge Blog for more wonderful inspiration from my DT sisters! They are awesome, and you'll see why when you get there! If you get the chance, I hope you'll play along with our challenge. I'd love to see where this photo takes you with creativity this week! Have a fabulous weekend and happy stamping!!!! LORIE!! Is that the background that we made in class in Cali? This is a pretty COOL card!! LOVE YA! Love the design and colors in this card! Very summery feel.